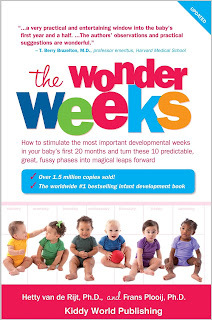 Wonder Weeks are now the Wonder Months ~ My Baby Sleep Guide | Your sleep problems, solved! 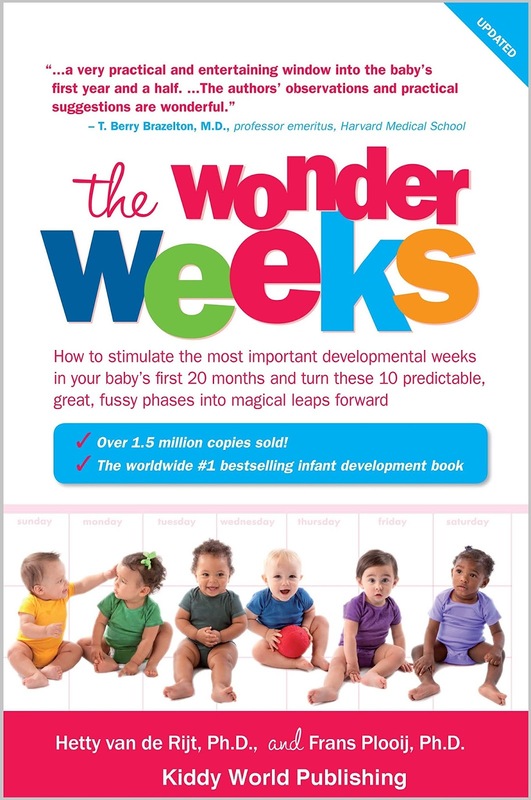 After some complaints from one of my perfectly wonderful sisters, I have updated the When are the Wonder Weeks? post to include months along with the weeks. I am not sure where to post this...but I am wondering if you can help me. If you get through this your an angel..its so long. I am in the process of sleep training w my 6 month old (7 mos. in 4 days)and weaning off of all the night feeds cold turkey except the DF (He is a very big baby, has 3 solid meals and 4 bf for 15 min. plus the df. )until he gets used to eating more during the day, I will then drop the dreamfeed.When he cried I went to the crib sat and used verbal reassurance, did not pick up, until asleep moving the chair every three days until out of the room.i didn't have to move the chair after 3 days, he just started sleeping thru except 1 or 2 wakeups. I didn't have to do this for naps just nightwakings. awake time 2hrs. 08 min. Because his awake time was so long the catnap was dropped, don't know if this was a one time thing or he is dropping for good. I am hoping he is dropping it. I hate the third catnap, it was always hard to put him down for this one. He normaly goes down at 6:30pm if his third nap was very short or almost non-existant....like 15-20 min. Last night he was ready to go down at 6:45pm, but someone came to the door and made it later. From what I understand is when lo drop the third nap, the bedtime is moved up earlier until thay get used to having 2 naps. Feed and cuddle your baby as much as possible... Drop this schedule and relax, follow your instincts and your baby's cues. This can be a lot easier than you have made it for the both of you. Other mammals do no raise their babies by clocks.. Watch how a mother cat cares for her kittens. You can do this. This blog is here to help parents improve upon their children's sleep. Many parents here choose to do a routine for personal reasons. Just as you have your own way of doing things, so do other parents. If you do not have a comment that is encouraging and helpful for what a particular parent is trying to do, then please do not leave a comment. As for doing things like other animals, that doesn't really make sense. Should we eat our babies like other animals? Or leave them to fend for themselves the second they are born? Humans are unique, just as each human's lifestyle and personality are unique. We all do things differently and what works for someone is not what works for someone else. Dropping night feeds can lead to an earlier wake up time. I notice this more if more than 1 is dropped in a short period of time or if mom has to encourage the dropping of the feeds. HSHHC does suggest times for naps. But these will fit in with your bedtime and wakeup times. So if he normally wakes at 6 am, then your first nap would be earlier than a child that wakes at 7 am.And I always consider wake time---even with my 4 year old. Also take a look at the wake time post which will give you an idea of average wake times. If you do too much wake time (or too little) wake time, as you said, you may have issues. It appears that you have much too much for his age. Yes, when you drop the third nap or if he naps less than usual you will want to do an earlier bedtime. As to why he woke early, I can't say for sure. You can't really look at one day and say this or that happened. And you will know better than me if he was hungry or not. We all have our off days. You have to look at everything over at least a few days, likely more. If you keep a sleep log (there is a post on this) you will be able to see patterns to help figure out what is determine what. There is a post called early morning wakings in the index that may help you troubleshoot more. I would keep the dream feed until all other night feeds are dropped. There are a few dream feed posts in the index to help you guide you on this. That was what I was thinking..about the dreamfeed. Thanks:) We appreciate all the hard work you do for this blog and helping mothers w/ the most important most rewarding, but hardest job on this earth..being a mother! Sorry, I didn't mean to be rude. You obviously have very different opinions than many of the moms that comes to this site for help which is fine. But this isn't a debate site. It is here to help parents that choose to do things a certain way. There are plenty of sites out there that offer advice for parents that do things the complete opposite way, as well. I agree that many parents stress out over things and get much more worked up about 'figuring stuff out' than they need to which is why I have tried to address this issue in multiple posts. But there many parents that get extremely overwhelmed by not having some kind of routine and having their baby wake up multiple times at night for months on end (obviously what you consider normal for a child to wake up will vary from what I consider normal--but you can find research that backs up either opinion). These parents find it much harder to do things the way you prefer. I know, I've talked to hundreds of them. I am one of them. It may not make sense to you that me and others are like this, but it is what it is. As for the wonder weeks and sleep training, I usually advice parents to avoid sleep training during these times, as well as other difficult periods. That video is sweet. Maybe you consider me uncaring to ever sleep train my child in anyway (and by sleep train I don't mean just cio)? I have helped my children learn to sleep while still being there for their needs. I go to them whenever they need me at night. I cuddle them during much of their awake time. I do not think sleep training means you are automatically a hard unkind parent that doesn't ever hold your child or respond to them. Thank you for your reply. My impression from the original commenter is that she was overwhelmed by the actual scheduling! So much so, that she needs to ask somebody on a blog for advice about how to approach the care of her baby. I was advising that it might be easier to start listening to her own maternal instincts and follow the baby's natural built in cues..in the long run I think that approach is less stressful for everyone. Less stressful..and also very empowering for the mother. As a doctor myself, I feel that pediatricians/"child experts" have become too involved in "parenting advice" and have robbed mothers of following their natural instincts. I also happen to be one of those mothers with a baby who wakes frequently...at 17 months she wakes up on average every 2 hours.. it's rough in this modern world..a lot of us have no extended family to help! Yes it's rough..but the infancy/babyhood years are critical, and I think it is wise to approach a baby's care naturally, without a clock or an "expert." Anyway.. I just came across this blog from a Wonder Weeks link, nice chatting with you. I have a feeling this will be long, but I feel like sharing my thoughts right now. You are likely correct that the previous commenter (and I apologize to this commenter for "talking behind her back" but I wanted to address this) was a bit overwhelmed. But it sounds like she is doing sleep training (and a routine with that) to help address the more overwhelming issue she is facing of no sleep. Just like most things new, it is hard to figure out at first but gets easier as you figure out what you are doing. And sometimes parents rely too heavily upon advice from elsewhere when they feel overwhelmed and confused and can't figure out how to better their situation. Anyway, I do try to offer words of advice related to this when I sense it going on, but I don't always remember to do it and don't always notice it. I try to do the best I can given the small about of free time I have. And I have posts that address these issues of overdependence on books etc, but I am sure not all moms see these posts. I do not think it is a weakness to have to ask for advice. I think it is a strength to ask for advice when you feel you need it. Parents, regardless of what parenting method they are doing often have questions. Even you came from a wonder week link--that offers advice. In the past we'd ask the family that we lived with or nearby questions and we'd very likely already know much information already from helping to raise other people's baby's. But this isn't so today. Sometimes we need to ask for advice, whether it be about how to help our baby sleep better so we don't feel like we are going to lose it, or advice on how to help our colicky child, or how to figure out breastfeeding. Are they wrong to seek for advice for their child's wellbeing as well as their own? Most of the questions I get are from parents like this--- They have tried the natural route, they are overwhelmed beyond belief and unhappy in their current situation and want to change things. I do not think they are trying to seek the easy way out. They feel things need to change for their good and their child's good and they seek out a way to do this. Maybe even their "instincts" tell them to seek help. I'm sure there are some who have been told they have to do something a certain way even if it goes against what they feel they should do. This is unfortunate but happens with pretty much everything. It is another form of social pressure and it certainly is strong if it comes from a pediatrician. People certainly should not be telling someone they have to do something a certain way, but people also should hopefully have the ability to make decisions themselves and not do what other people tell them to do if they don't want to do it. I feel when people are well educated on a subject they are able to look at all their options and make an informed decisions that suits them best rather than feeling pressured and clueless about what others are telling them to do. This knowledge, I believe, is empowering. Maybe it isn't for all, but I know it is for many. I believe the infancy and babyhood years are critical, but I do not think they are the only critical years. And I do not think that there is one specific way to do things to create the best outcome. Babies are different. Parents are different. And life situations are different. You work I'm guessing? Wouldn't that be against a mother's instinct? There are of course a million other examples of life situations and unique characteristics (the need for sleep or turning into a horrible, half insane person, being one of these--not to mention the detrimental effects lack of sleep has on children) that shape what we do as parents. .....You assume that "natural" is best for everyone. Really? Do you understand everyone? How you do you know what is best for everyone? How do you know how a parent and a baby will react to "natural care giving?". Every parent for that matter. And why is your definition of "natural" the true definition? What is natural for one person certainly may not be for another. Applying absolutes to anything is a risky business (I apologize if I have done that anywhere here, it was not on purpose--maybe you didn't mean to do it either). There are endless variables in any situation. I can't help but consider the amount of broad knowledge (as in, not purely one sided) you have on this topic as well as real life experience with moms to make such statements. Have you seen what lack of sleep to an adult and child can do? Many children will not sleep easily, even when things are done "naturally". They end up crying much of the day and night from over tiredness and their caregivers are unable to get them to sleep. Some children end up awake for hours in the middle of the night for months on end. Some will not go to sleep until 4 am when mom and dad have to get up to go to work at 6. I sure hope the doctor doing brain surgery on someone isn't that parent! What about the child who ends up with problems due to sleep deprivation? There is a lot of research out there on these effects. Then there are the parents. You may be fine with lack of sleep for months on end, but some people are not. It is, to a great part, a genetically controlled trait. So assuming that others should be able to functionally do what you do is not fair. Lack of sleep causes countless problems. And these problems end up influencing other people too. What about the mom whose sleep deprivation pushes her into depression. What about the effect that has on her marriage, her baby, her other children. Is this really better than seeking help to figure out how to get more sleep? What about the person that is so sleep deprived they are barely able to drive and end up hitting someone? It really happens, I've even witnessed it myself! What about the mom that is overly exhausted from breastfeeding every 2 hours day and night (and maybe for a 5 hour cluster stretch in there too) and decides she can't do it anymore and gives up breastfeeding? How can you say for sure (because I sure can't and I daresay researchers can) that doing something a certain way, despite the difficulties of it for some people and their children is better than any every other way? Hmm, maternal instincts. I am not sure what definition you are going by. Obviously not the true definition of instinct like a FAP as this is supposed to be species wide and not be changeable and obviously maternal instincts are neither of these --(ie. there people with apparently no maternal instinct (even when you take mental illness out of the picture) and how these instincts manifests seem to vary). Perhaps maternal impulse is a better word to use? Anyway, I'm guessing you mean the desire a mother has to nurture and protect her child. I believe there is some kind of "instinct" that makes most females be nurturing (maybe all but environmental factors influence them? ?- who knows). I don't know how much further I would say it goes than this. I think a lot of what is considered instinct is actually maternal thinking (your knowledge or instinct as a mother is there from your constant vigilance, engagement and time spend with your child--you know them better than you know yourself from watching them grow every minute of most of their life, your bond grows more from chemical and hormones and the desire to be a mother and time spend with your child than from instinct). And I think past learning and experiences are included in there too. So when we respond instinctively, we are actually responding according to this knowledge. I think we also likely respond in ways related to our personality (which has to process all this data) and I surely believe that some of the time our instincts are actually due to the holy spirit guiding us. Anyway, this is what I feel goes on so really, when we think we are responding instinctively we are responding with knowledge. And so I don't see a problem with acquiring more knowledge, as long as we use wisdom in evaluating and using it. I believe knowledge is useful in all things. I don't think it suddenly becomes useless when it comes to parenting. Besides, I can't understand how one can truly work off of just instinct. I mean, a truly clean slate with no past knowledge. I don't think it is the best way to go. If you use this method then there is no help with initiating breastfeeding or advice about breastfeeding patterns (cluster feeding, growth spurts nursing strikes) which would no doubt lead to some stopping breastfeeding (as it already so often does) as well as some starving infants, there is no help or advice when you have a colicky baby you cannot calm, there is no advice on ways to reduce sids (because most of these, with no background knowledge, are not instinctual), there is no advice about the need to (or how to) burp a baby, there is no advice about so many things that I really don't think you somehow know because you are nurturing and have the desire to project your child. We know them because we have had experience with them our whole lives or learn about them when we become a mother. And what about health related issues? Where does this 'rely upon just instincts' end? Do we not take our children to the doctor either when they are ill or injured? So, obviously we disagree. But so have people for as long as the idea has existed. Complaints? Okay, I did. I was actually looking at your blog to see when the wonder months are because my 16 month old has decided to nap terribly! It may be his teeth, or maybe a wonder month (I haven't gotten to that post yet). Good luck figuring out what is going on Sharon!